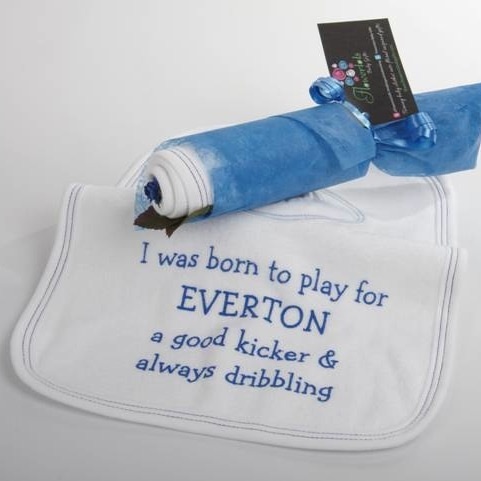 A hand tied stem containing an EvertonnBib and a Pair of Socks in Blue and White. Beautifully finished with Rose petals and a Mulberry paper flower, wrapped in Blue floristry wrap, tied with blue curling ribbon. 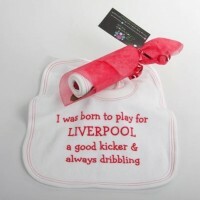 Gifts will be posted using Royal Mail First Class Post within 3 to 5 days. 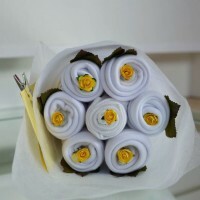 Your delivery policy Delivery All Flowertots Baby Gifts are sent out within 5 - 7 working days and are sent via Royal Mail First Class Post within the UK. Your Returns Policy We maintain the highest standards of quality control. However if you are unhappy in anyway with your purchase you may return the goods to us for a full refund of the purchase price, within 7 days. 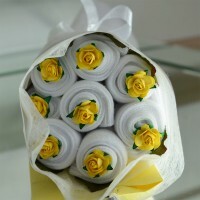 If you would like to return your purchase to us please email us at orders@flowertotsbabygifts.com to advise us of the return. Goods must be returned to us via recorded delivery and all tracking numbers should be retained to ensure that the goods do reach us. Once we have received the returned goods a full refund of the goods price will be issued.